CASTOR OIL is one of the most trusted and nutritious oils to combat hair loss, breakage, and even constipation! * Aura Casia’s 100% organic castor oil works wonders in relieving hair damage, dry hair, dandruff, and helps strengthen hair. WORKS ON all hair types: curly, thick, thin, coarse hair. A little goes a long way, this can last awhile while healing and re-growing your damaged hair and treating dry, sensitive skin. KNOWN TO HELP: Drastically reduce PMS cramps and constipation by relaxing the smooth muscles. NO fillers, binders, or nasty chemicals. This brand is made of pure, food-grade and high-quality skin care oil. Very high in vitamin E, minerals, proteins, and omega-6 and -9 beneficial fatty acids. Its unusually high ricinoleic acid ratio makes it extremely beneficial for your skin and hair health. With this perfect ratio and variety of nutrients, your scalp can heal and grow shiny, strong, and healthy hair. Not only is best known as a hair growth stimulant, but it has been used topically for acne and other skin conditions, as well as rashes and wrinkle reducer. Plus, it has natural antibacterial and antifungal properties. PMS and constipation troubles? Castor oil packs are known to drastically reduce symptoms. Just apply a soaked washcloth for 45minutes. How much should I use on my scalp? This depends on the thickness and length of your hair. You should apply enough so that your hair is damp, not soaked. Wrap your hair with a bonnet or silk hair wrap so that it protects any fabric from staining. 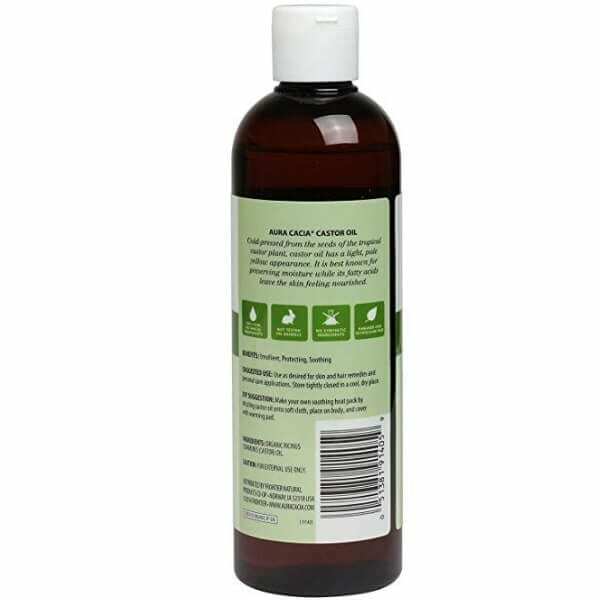 How can I use Aura Cacia 100% Organic Castor oil for PMS/constipation? Wrap saran wrap around your stomach to keep this from falling off and allow your body to soak it in for 45 minutes. This can be repeated a couple of times a day, a few hours in between. How does this castor oil help decrease pain from PMS and relieve constipation? Castor oil is absorbed through your skin and relaxes smooth muscles, which contract and cause pain. This simple mechanical action has a beneficial influence on all hollow organs, specifically the blood and lymph vessels, the uterus, fallopian tubes, bowels, and gall bladder. A castor oil pack is placed on the skin to increase circulation and to promote elimination and healing of the tissues and organs underneath the skin. It is often used to stimulate the liver, relieve pain, increase lymphatic circulation, reduce inflammation, and improve digestion. Cold-pressed means the manufacturer did not use excessive heat, chemicals, or solvent to extract the castor oil from castor beans. This is a cheaper and faster method that strips the nutrients and the oil’s purity becomes compromised. 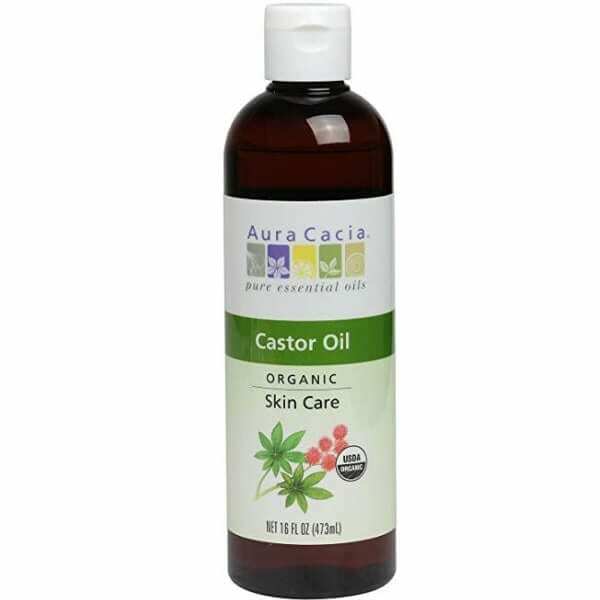 Apply Aura Cacia 100% organic castor oil lightly along the section of your scalp. Depending on your hair type, wear a SILK bonnet or a general sleep bonnet (hair cap) & sleep overnight OR use during the day for a couple of hours. While laying down, apply this directly to your stomach and wrap with saran wrap. Place a heating pad over to keep it warm and for pain relief. If you’re not sleeping with this, you can remove and use throughout the day. 2. Apply oil 3 times a week for extra dry hair, otherwise at least 2x a week to start. Maintenance 2x a month.